This past week has been one of the hardest of my life. I'm not kidding either. Maybe I won't think it was one of the hardest in a few weeks but this week was rough. Back in July our friends came to visit and stay the night with us. Well, when they were here a couple of us showered, I ran the dishwasher and we all used the toilet; the normal things. Well, I went down in the basement and saw that the sewer line had exploded and there was poop all over our floor followed by a big pool of water that had come up from the drain from our sewer line. Have you ever cleaned poop off your basement floor? I hope you can say no because it is awful. We got a plumber out here to snake the line and he informed us that the sewer line was broke right where it connects to the main city sewer line. I tried to remain calm as I asked him what he thought it would cost to fix something like that and he said he would guess around $1,000. ha ha! I laugh at his answer now. A plumber came out and informed us that to repair it they would have to dig a trench in our entire back yard and because our neighborhood is older they really buried the pipe lines, 15 feet down. He gave me a quote of $5,400 and I about fell over. Thankfully we found someone that did it for much cheaper plus insurance gave us $800. We could use water in our house but minimally, as in we could flush the toilet once a day. I showered at the Y and didn't run the dishwasher. However, the plumbers didn't get the license from the city in time to get the repair inspected so we had to wait another week and by that time our water usage was almost at zero because it would constantly back up. And that is when my husband pooped in a bag. Because when you have lived in Burma (and I am not even going to go into the poop stories from there on the blog) but pooping in a bag isn't so bad. I did not do that! The plumber was nice and walked me through the process. He told me it was a big job because they would dig deep and then said, "your yard is going to look like Beirut." And he did not lie. I also felt horrible because our nice neighbors who live behind us have a little baby and they had to empty their shed because the sewer line was right under it. I was told they would only go a few inches into their shed area and they dug a massive hole over there. Then when they finished the repair they put all the dirt back but it isn't compacted yet so we have big mounds. It looks like a giant monster ground hog came through our yard. Thankfully our neighbors have been so nice and understanding with this entire ordeal. Then after the big mound is there I'm supposed to water it so it can compact. I was out there with a hose watering dirt. However, I see now what a waste of time that was as in the last two days Wichita has received over 10+ inches of intense rain. I'm sure it was more than that because people have had to get rescued from their cars due to flash flooding. 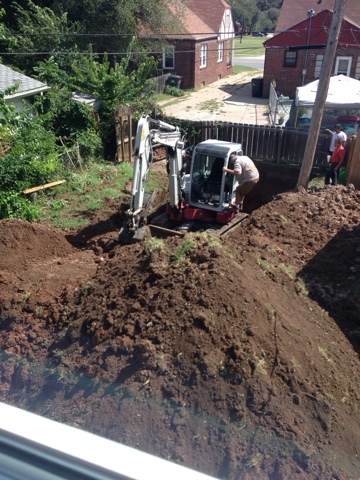 Anyways, all the rain made a massive trench and the biggest trench is right under or AC unit. 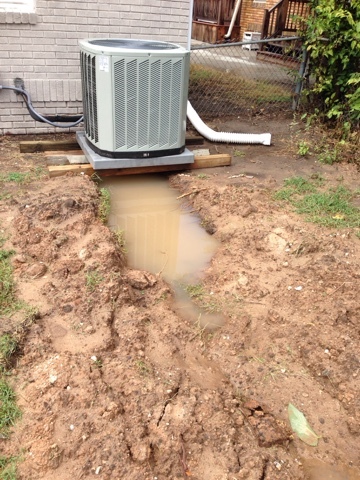 I'm so thankful the guy that suspended our ac unit (so they could dig the trench under there) and put three beams under the unit or else our ac would be under water as that trench is 3+ feet deep. I know because I have been out there bucketing water out of it and trying to fill the trench again with dirt. Thankfully Dave went out there and filled it the best he could. 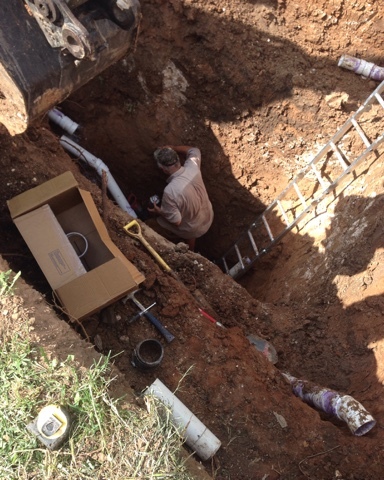 If you are wondering how our sewer line broke it is because they think the city line got replaced at one point and they didn't attach the proper pipes to our old house pipes. I am sure I could fight the city on it to pay if I had pictures and a letter from the plumber but to be honest, I don't have that emotional energy in my right now. Then to top it all off, with all these rains we have two leaks in our roof. I'll be working on that tomorrow (Saturday) so hopefully by the time this is published on Monday something will be in route to get this roof fixed. As far as our yard, we have to wait a couple of weeks for it to compress down, flatten it out and hopefully plant grass. OH and my tomato plants and garden got demolished. Thankfully, I moved two of my basil plants to a pot but my tomato plants that had tons of little tomatoes got destroyed. And yes, I cried a lot over my tomatoes. I cried over my yard and then I cried that I was crying. BUT I can flush my toilets, do laundry, run my dishwasher and shower at the same time so that is a huge blessing. Just reading that stressed me out! I'm so sorry you had to go through that. I'm glad your neighbors were understanding about their shed and all the dirt. That is funny, though, that Dave pooped in a bag. But oh my gosh. I hope you were able to get the roof fixed! I'm sorry we didn't get to hang out, though. But I know that was necessary. I have been praying for you guys! I know dealing with house stuff is super stressful. Oh girls. We have basement issues, and this is one of my worst fears. Our sewer line backed up a day before Thanksgiving one year. Awesome! Now we try to get it snaked once a year or so, but it still happens because we have a willow tree nearby that apparently has love for our sewer line. We also have a wet basement that leaks, and we're about to put down $7k for an inside drainage system and sump pump. Yayyyyy homeownership! Oh my goodness. I can't even begin to imagine. Worst week of your life sound about right!